Color is part of the decorative aspect of baseboards. Many manufacturers prime various styles of baseboards for painting, and you may paint them any color you want. White baseboards provide a clean contrast to hardwood floors, but the baseboards could be painted red, blue or even hot pink. Baseboards can be ornate or simple. Color is part of the decorative aspect of baseboards. Many manufacturers prime various styles of baseboards for painting, and you may paint them any color you want. White baseboards provide a clean contrast to hardwood floors, but the baseboards could be painted red, blue or even hot pink. Baseboards' type and style are additional considerations. Matching wood baseboards' color to the color of their room's hardwood flooring is an option, but you may want baseboards that visually separate the floor from the walls. Baseboards are available in materials other than wood and in various colors. Plastic baseboards are typically white, and they are flexible and durable. 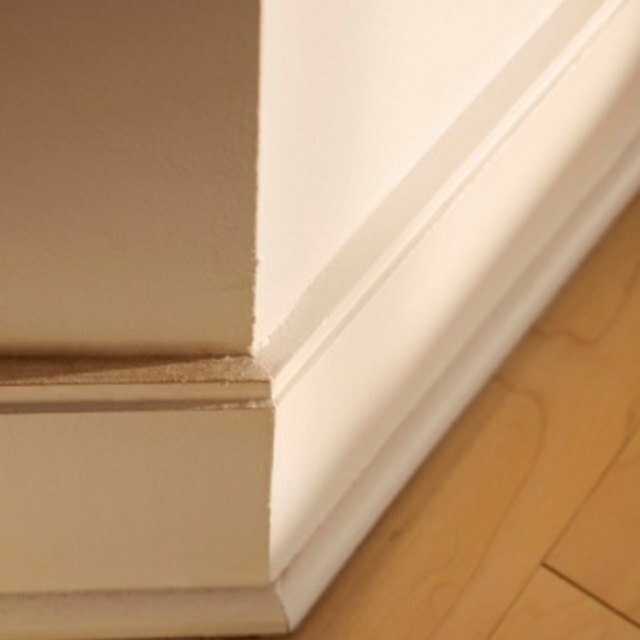 Compared to their wood counterparts, plastic baseboards are easier to install on uneven walls. Wood composite baseboards usually are sold primed for painting and can be painted any color. They are less prone to cracking than natural wood baseboards and are lighter, making them easier to handle. White is a common baseboard color for rooms with flooring that is wood, carpet, ceramic tile or stone tile. Some manufacturers produce white baseboards. Buying primed baseboards and painting them yourself, however, can save money. You could throw convention out the window and paint baseboards green, black or polka-dot. Natural wood baseboards can be finished in any color to blend with wood floors. Stain or paint some test boards to achieve the desired finish before you complete the entire project. Style is personal, of course, but some guidelines simplify baseboard selection. Ornate, carved baseboards may not work in a modern-style home. Likewise, a simple baseboard with clean lines can look out of place in a traditionally styled home. Size is also a factor. Baseboards can be thin, thick, tall or short. Consider the size of your home relative to the height and thickness of baseboards. Quarter rounds are recommended for wood flooring. They are rounded pieces of trim measuring about three-quarter inch by three-quarter inch. Wood flooring isn't always perfectly smooth, and walls aren't always perfectly straight. Installing quarter round trim on flooring in front of baseboards helps to cover gaps between the baseboards and the flooring. Quarter round can be stained or painted to match the floor or baseboards. How Do I Unwarp Wood Fences? How do I Soak New Uniforms in Vinegar? To Cut Plywood, Is the Finished Side Up or Down? What Bug Is Commonly Found Hiding in House Trim?